Thanks to Paul-Carey Kent and Christina Niederberger from Friday November 1st 2013 there is a rare opportunity to see all five Buskova films in sequence at the ASC Gallery on Blackfriars Road, London. 'It's about time' is the apt name for this intriguing group exhibition. It is also about time that Paul Carey-Kent's articulate passion for art translated into an exhibition. It looks like it will be worth the wait. The over arching concepts are coherent and the artists have been judiciously selected over several years after trawling hundreds of exhibitions. Most people will probably make it to the exhibition during the healthy two months run from November 1st to December 21st 2013. However, all these people will be too late to see German born artist Harald Smykla perform live in response to Buskova's five films at the private view. 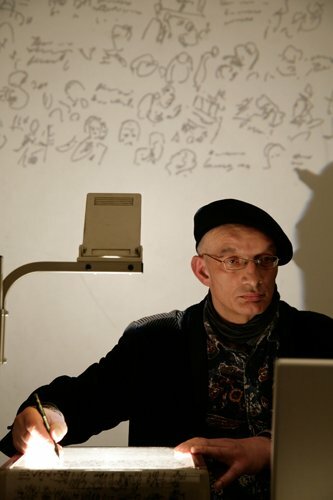 Smykla is known for his movie protocol performances involving drawn pictographic notation of films. Much of the work has been made especially for this show by its international cast of artists:Emma Bennett, Tereza Buskova, Andy Charalambous, Susan Collins, Clarisse d’Arcimoles, Alison Gill, Nick Hornby, Alex Hudson, Livia Marin, Pernille Holm Mercer, NikaNeelova, Christina Niederberger, HaraldSmykla and Dolly Thompsett.